Give the Manning brothers this: They’ve always had impeccable comedic timing. Peyton deadpanned that Drew Brees had ended the happiest stint of his life by breaking his career passing yards record Monday night, and Eli had his own crack when asked about Odell Beckham Jr.’s scathing interview in which he criticized his quarterback, his city, his team and his coach, to name a few. 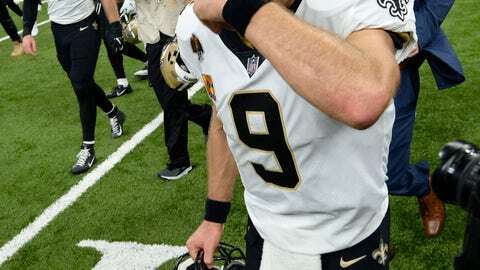 When Brees broke his record for most career passing yards Monday night in the Saints‘ 43-19 rout of Washington, a congratulatory message from Peyton, a New Orleans native whose father, Archie, starred for the Saints, played on the Superdome’s video boards. “Thanks to you, that’s over now,” Manning continued as the laughter erupted in the stands. “You’ve ruined that for me. Brees has 499 TD throws, one fewer than Tom Brady and 40 fewer than Peyton, who wasn’t able to make it to New Orleans on Monday, a day after cheering on the Colorado Rockies in the NL Division Series at Coors Field. Earlier Monday, Eli made it clear he hadn’t seen the interview ESPN played Sunday morning in which Beckham, sitting next to rapper Lil Wayne in an odd optic, steamrolled the Giants, the city, his coach and his quarterback. Beckham has taken a lot of heat for his comments but said he doesn’t regret anything he said. And he had a breakout game against Carolina, catching eight passes for 138 yards and a touchdown and throwing a 57-yard TD pass to running back Saquon Barkley after receiving a lateral from his quarterback. Eli Manning led the Giants back from an 11-point, fourth-quarter deficit and put them ahead with a last-minute score only to watch Carolina’s Graham Gano kick a 63-yard field goal with 1 second remaining to send the Panthers to a 33-31 win that left the Giants at 1-4. Beckham had complained that the Giants don’t throw the deep pass, but they had six pass plays longer than 20 yards against the Panthers, including Beckham’s long TD throw to Barkley and his 33-yard TD catch from Manning. NBC analyst Rodney Harrison suggested Beckham shouldn’t be criticizing his coach and his quarterback after signing a five-year extension in the offseason that could be worth up to $95 million. Other takeaways from Week 5 included T.J. Watt’s second three-sack performance of the season, Marshawn Lynch again getting ignored at the 1-yard line and watching his team pay the price and Steelers coach Mike Tomlin lashing out at the league after the roughing-the-passer tally topped 50 for the season. T.J. Watt’s move to the left side of Pittsburgh’s defense has made all the difference for the younger brother of Texans star J.J. Watt. On Sunday, the second-year linebacker sacked Matt Ryan three times, had three tackles for loss among his team-high eight stops and forced a fumble. Then, he went home and tuned in to watch his big brother record a sack and a tackle for loss in the Texans’ 19-16 win over the Cowboys. Now both the Seattle Seahawks and Oakland Raiders have done it, although on very different stages. With the Raiders at the Chargers’ 1-yard line, Derek Carr was intercepted by Melvin Ingram. In Super Bowl 49, Russell Wilson was picked off by Malcom Butler from the 1 with less than 30 seconds left when the Seahawks decided to throw the ball instead of handing off to Lynch while trailing the Patriots 28-24. With Watt and Jon Bostic getting whistled for roughing the passer in the Falcons-Steelers game, Tomlin has had it with the league’s emphasis on protecting the passer this season, an effort that has resulted in inconsistent calls and game-changing flags on seemingly textbook tackles . Tomlin could face a fine over his criticism of those calls.